Channel 4 faces a huge pressure to ensure they get their casting correct when the Great British Bake Off moves to their network from the BBC in 2017, and all eyes are on who will be hosting the television favourite. Paul Hollywood has announced he’ll be sticking with the show, while former Spice Girl Geri Horner has been tipped as favourite to join the crew, and What Are The Odds has the latest on who is in the frame to join as host. Sky Bet have the artist formerly known as Halliwell priced at 5/2 (3.50) to join Hollywood in a co-casting role after Mel Giedroyc and Sue Perkins confirmed they wouldn’t be moving to Channel 4. Horner won the third episode of this year’s Great Sport Relief Bake Off, demonstrating her skill with a chocolate and beetroot tray bake and some 3D biscuits, but the move would be an odd one considering the 44-year-old has very minimal hosting experience. 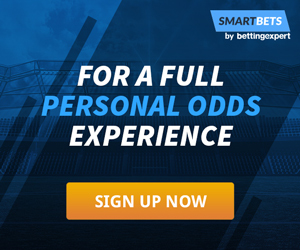 The same can’t be said for Dawn French and Jennifer Saunders, however, one of Britain’s great female comedy duos, listed at 5/1 (6.00) to take over where Mel and Sue left off. French and Saunders would make for an easy transition as far as the migration goes, swapping one hilarious tag team for another, although much of their work has also taken place with the BBC. An outside-the-box move could be to take on Sunday Brunch pairing Tim Lovejoy and Simon Rimmer following their fine progress with one of Channel 4’s most consistent weekend programmes. Switching from an all-female duet to a male cast would be a bold move for Channel 4, however, with Lovejoy and Rimmer currently 8/1 (9.00) to take over from where Mel and Sue left off. 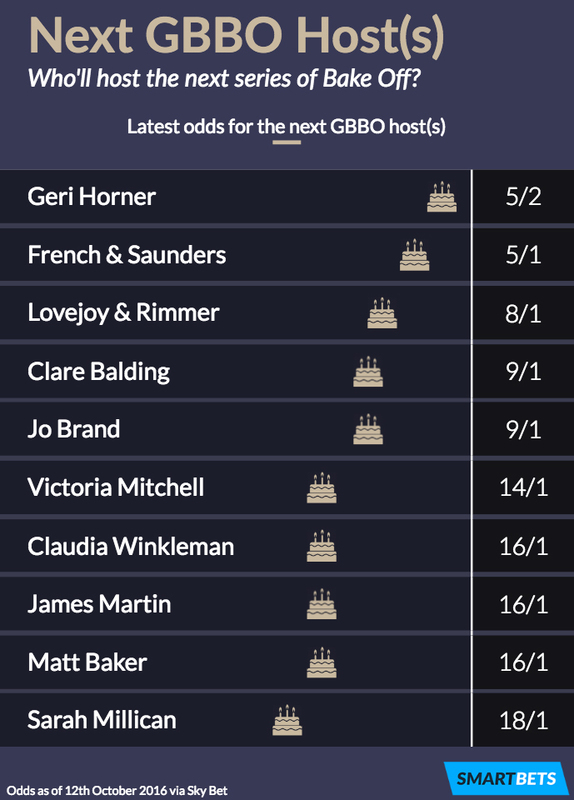 That’s as far as things go for the double teams, but a staple of strong hosting contenders follow soon after, with sport specialist Clare Balding and comedian Jo Brand each listed as 9/1 (10.00) picks. Alternatively, punters might consider last season’s winner, Nadia Hussain, a favourable bet to get the gig at 12/1 (13.00), sat level alongside sometimes-radio host and QI presenter Sandi Toksvig. Channel 4 might be a little too “on the nose” if they were to recruit Countryfile presenter Matt Baker for the host position, and he’s 16/1 (17.00) to move to Channel 4, as are BBC regulars Claudia Winkleman and James Martin. Former Big Brother host Davina McCall is a major outsider to star alongside Hollywood at 20/1 (21.00), while restaurant critic Giles Coren follows up the pack as a 25/1 (26.00) dark horse.